Tummy Tuesday is here! Add your links to the blog hop below my post. Joe’s Crab Shack closed near the Murphy-Wilmot library and it’s place is now the Bisbee Breakfast Club, a local Arizona chain with it’s first one opening up in Bisbee in 2005. The other day I popped by as several people walked in a group. The place was hopping but they seated people pretty quickly. They picked up my order quickly but not suprisingly there was a bit of a wait for it to be cooked but it was served hot pretty much as soon as the cook put it up. The counter area looks like a old-fashioned diner so you can see the cooks hustling back there. They put out a plate with a sandwich with lotsa lotsa meat and I thought, what’s that? That looks good. Watching food come up makes you want to point and click when it comes to ordering. Order a mimosa while you wait, it comes in a jam jar, mason jars being all the rage these days, and it’s good. I took a counter seat of which there were several open. Most people seemed to have come here with friends even though it was a weekday lunch. I love omelettes and they had a great selection. Since I’ve been eating a lot of meat lately, I ordered a Harvest omelette filled with squash, spinach, mushrooms, onions and a swiss cheese for $9.99. It came with hash browns and toast or a biscuit but as I’m losing weight, I told the waitress I was on a diet and asked if there was an alternative. She offered fresh fruit and that worked for me. The fresh fruit turned out to be pineapple, cantaloupe, grapes, and melon served in a fruit cup so I dumped it out next to my lonely omelette who was sad without my usual hash browns I almost gave into temptation as I was curious if they passed the crispy crispy test but I was good. (Yeah, yeah, yeah. I know Mimosas are not on my diet but it had orange juice in it so don’t I get a half point for healthiness?). The omelette was very good but because it’s all veggie, I think it needed a little something-something to spice it up like garam marsala or salsa. Yeah, a salsa would have been a great topping. Tucson does have an early bird special from 5am-8am for $5.99 but I have no clue what’s it in because I don’t get there that early. What? I never said I was a morning person. You’ll have to let me know what’s in it. They’re Bisbee and Mesa locations have different specials so if you’re into specials (and who isn’t?) check the location you are going to for their specific day’s special. They also have local beers but I’m not a beer drinker so you’re on your own there. I’m good with my mimosa; it leaves me feeling semi-virtuous with my Vitamin-C hit. My verdict for restaurant review? B+. Service and omelette was very good; mimosa was good and served fast; and I liked the ambience of updated casual diner. Good place to go with your friends for lunch or breakfast. Join the Tummy Tuesday’s blog hop. Post anything about food: a restaurant review, a recipe, food photography, a funny food quote, a food song, an essay on food — anything food-related because you know like the song says, “Food, glorious food.” Add your food blog post link below. Yummy. 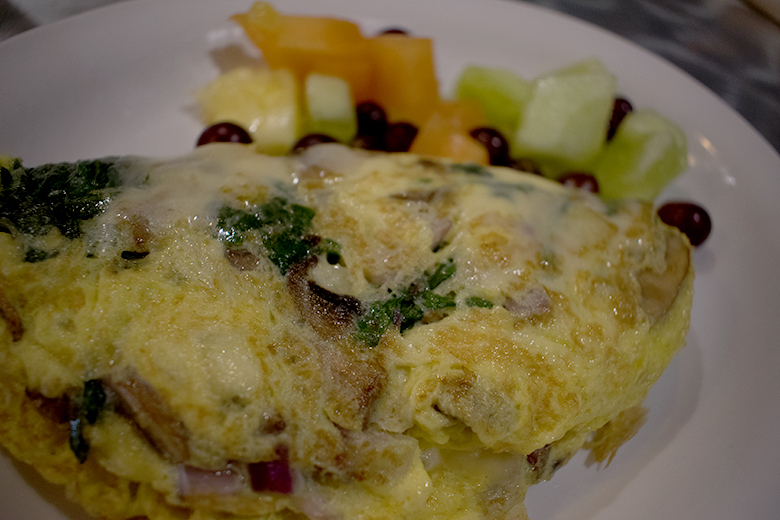 That omelette looks fabulous and fresh fruit is what I do too. What a lovely meal. Me too, I love fresh fruit. I’m happy that restaurants are beginning to accommodate people on healthy eating plans more and more and the fruit is getting better too. That omelette looks delish, Mary! Yummmmm! Thank you! It’s great when people think a photo looks delicious. Feline Friday : Midnight asks, Is it Halloween yet? Let your words speak what your heart thinks. What if We all Cared?